The village of Ruddervoorde is located 20 kilometres south of the town of Brugge (Bruges) on the N50 which runs between Brugge and Kortrijk (Courtrai). Driving from Brugge follow the N50 under the E40 motorway and through the village of Oostkamp, then through the village of Waardamme. You then pass an old castle on the left, take the next turning right at the crossroads to Ruddervoorde, turn right onto the N368 Sint-Elooisstraat. Follow this road into the village to the church which is on the left. You can also reach Ruddervoorde from the A17 motorway which also runs between Brugge and Kortrijk. 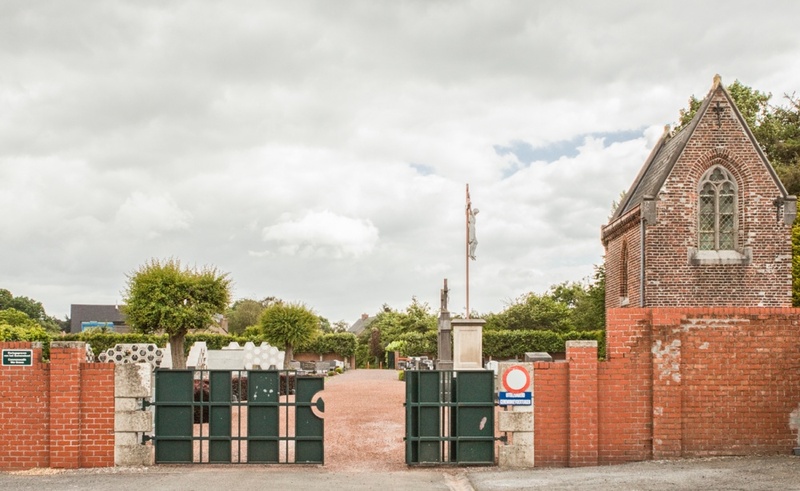 Take junction 11, the N368 towards Ruddervoorde, drive into the village to the church which will be on the right. On arriving at the church drive into the car park which is directly opposite. Continue to the rear of the car park where there is a narrow lane to the right that leads to the cemetery. On entering the cemetery walk around the small chapel then turn right up the centre path. 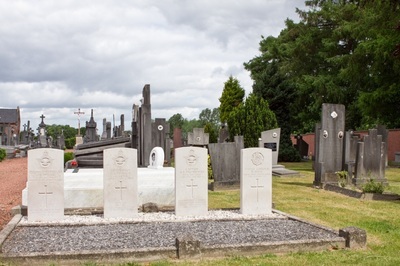 The four war graves are on the left hand side of the path close to the old entrance in plot no. 15. Ruddervoorde Communal Cemetery contains four Commonwealth burials of the First World War. 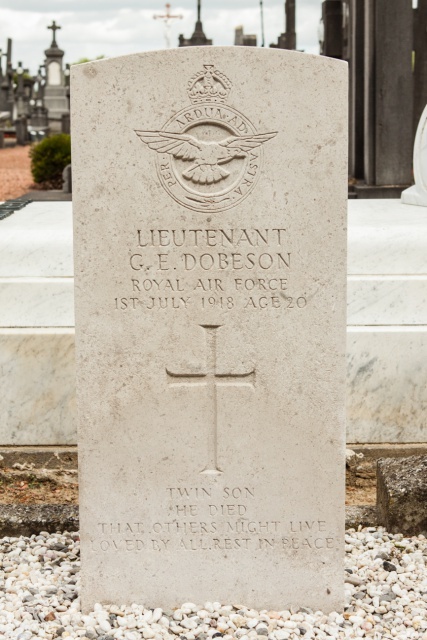 Lieutenant George Edward Dobeson, 25th Squadron, Royal Air Force, died 1st July 1918, aged 20. Son of William and Elizabeth Dobeson, of 17, Newton Terrace, Hebburn-on-Tyne. 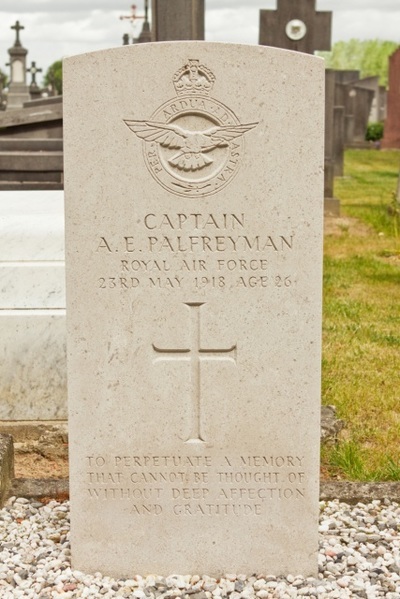 Captain Audubon Eric Palfreyman, 27th Squadron, Royal Air Force, died 23rd May 1918, aged 26. Son of the Rev. I. H. and Mrs. Palfreyman, of Hobart, Tasmania. 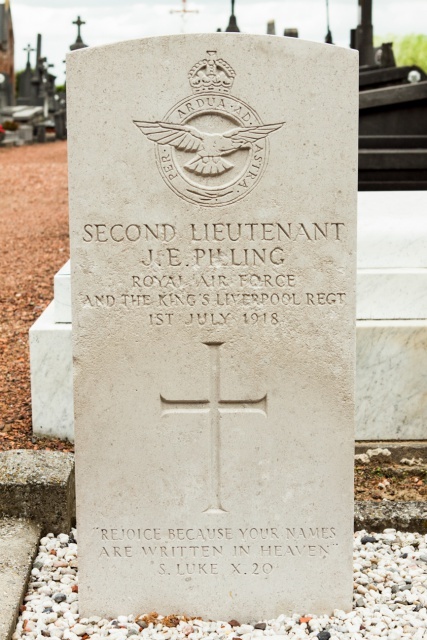 Second Lieutenant J. E. Pilling, 25th Sqdn. and The King's (Liverpool Regiment), Royal Air Force, died 1st July 1918. 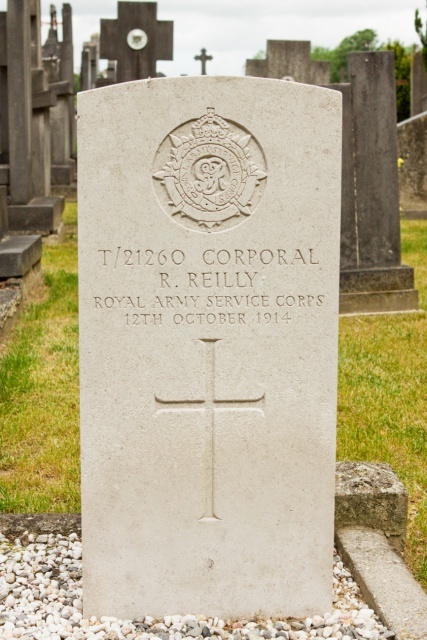 T/21260 Corporal R. Reilly, H.T. attd. 7th Cav. Bde. Field Amb., Army Service Corps, died 12th October 1914.